This message was preached by Colin D'cruz at Word of Grace Church on November 25th, 2018. To listen/download the audio please click here. To listen to the Sunday's worship and prophetic contributions please click here. Q. What does the word ‘Baptism’ mean? An example of this is ‘Dip tea’. What do we do with a tea bag? We immerse the tea bag in water. In New testament, baptism in water is recorded 4 times in gospel lessons and 5 times its recorded that Jesus is the one who would baptize us in Holy Spirit. Matt 3:11 – “I baptize you with water for repentance. But after me comes one who is more powerful than I, whose sandals I am not worthy to carry. He will baptize you with the Holy Spirit and fire. John the Baptist went around telling people to repent and get baptized in water and that someone greater will come and baptize them in Holy Spirit. What is the importance of this? Suppose a person gets pushed in a swimming pool, he gets to know it. Looking at him drenched, all the others get to know that he was immersed in water. Joel 2:28 – “And afterward, I will pour out my Spirit on all people. Your sons and daughters will prophesy, your old men will dream dreams, your young men will see visions. Acts 2:2-4 – Suddenly a sound like the blowing of a violent wind came from heaven and filled the whole house where they were sitting. They saw what seemed to be tongues of fire that separated and came to rest on each of them. All of them were filled with the Holy Spirit and began to speak in other tongues as the Spirit enabled them. Acts 2:14 – Then Peter stood up with the Eleven, raised his voice and addressed the crowd: “Fellow Jews and all of you who live in Jerusalem, let me explain this to you; listen carefully to what I say. These people are not drunk, as you suppose. It’s only nine in the morning! Here, what we understand is that when the people received the Holy Spirit, they got transformed. Sometimes, we feel timid, not bold enough to step up or speak up for God or share the gospel. The apostles were like that too. They were behind the locked doors for a very long time as they feared the Jews. Matt 26:69-70 – Now Peter was sitting out in the courtyard, and a servant girl came to him. “You also were with Jesus of Galilee”, she said. But he denied it before them all. “I don’t know what you’re talking about”, he said. Peter was afraid of a servant girl, he denied Jesus because he was not baptized with the Holy Spirit. The same Peter, after getting baptized with the Holy Spirit, received power and boldness. Acts 4:8-10 – Then Peter, filled with the Holy Spirit, said to them: “Rulers and elders of the people! If we are being called to account today for an act of kindness shown to a man who was lame and are being asked how he was healed, then know this, you and all the people of Israel: It is by the name of Jesus Christ of Nazareth, whom you crucified but whom God raised from the dead, that this man stands before you healed. These days, there is a lot of division especially when it comes to baptism. Baptism in water is very important but required only once. Baptism in Holy Spirit is very important too. But it is required not just once. In Acts 4:23-30, its written that after the release of Peter and John, they went back to his people, reported everything, and all of them raised their voices and started praying to God. This shows that they were filled with the Holy Spirit once again. 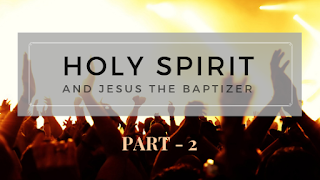 When we get baptized with the Holy Spirit, we receive power. Acts 5:15 – As a result, people brought the sick into the streets and laid them on beds and mats so that at least Peter’s shadow might fall on some of them as he passed by. 1. What can we do to get constantly filled with Holy Spirit? 2. How do we know we received power? When we get filled with the Holy Spirit, we feel something. We will know and experience love of God in a great measure. An example is we feel our earthly father’s love to a great measure when he takes us in his arms, hugs us and kisses us. We don’t feel the same measure when he just walks with us. We need to pray, spend time with God, exercise our boldness, power and other spiritual gifts. If it doesn’t work the first time, don’t be discouraged. Keep exercising.